Manufactured capital is the infrastructure, plant and equipment that we use to produce our products. It includes assets that are produced by other entities and those manufactured internally and excludes intellectual capital such as software. The management of these assets is a key business imperative and is considered an essential element in achieving manufacturing excellence and operational performance. Our high-tech, state-of-the-art rolling and semifabrication assets are central to our operations. The implementation of asset maintenance and care policies will improve asset utilisation and profitability. Hillside aluminium smelter (source of primary aluminium for Hulamin’s remelt and casting operation). Bayside casthouse (source of one-third of Hulamin’s requirements for rolling slab for the rolling operation). Hulamin is a conventional flat rolled aluminium products producer and operates hot, cold and foil rolling mills. Finishing equipment includes coil coating lines, slitting, sheet cut-to-length lines, cleaning and tension levelling and foil finishing facilities. A state-of-the-art plate plant is equipped with a range of equipment including sawing, stretching and plate cut-to-length lines. Hulamin manufactures the majority of the extrusion dies for its two extrusion plants. Heated billet is placed in an extrusion press which pushes the softened metal through the die to produce the desired profile. Finishing options include powder coating, anodising and fabrication. Hulamin operates an aluminium reclamation operation which consists of a shredding line, de-coater and induction furnace which is used to process light and coated scrap to produce aluminium sows that are fed into the three slab production lines. A R300 million investment in a scrap sorting, processing and recycling facility was approved in 2013 and went online in the third quarter of 2015. The facility was completed on time and within budget. The purpose of the asset risk management strategy is to provide a structured approach to the implementation of an asset risk management system, based on ISO 55000 and ISO 31000 principles. Our asset management strategy is aligned with international best practice. The focus is on asset care, operation and maintenance while considering the asset performance and the effect of external factors. To identify potential assets that pose a high risk to the overall business objectives. To determine activities related to assets that can cause harm to people and the environment while performing these activities. To identify the most significant equipment and determine the most appropriate approach to the development of maintenance tasks. To determine inventory categories and develop an approach for a specific spare or material. To determine issues that should be included in the specification of the asset such as training, integration of systems, energy considerations, critical spares and technology. The asset care team ensures that equipment is kept in good, functional condition and contributes to safe working conditions and prevents environmental damage. Our reliance on manufactured capital and our approach to the management thereof allow for us to extract the benefits and value of our assets. Hulamin has invested in the infrastructure needed to recycle Used Beverage Cans (UBCs) and other end-of-life and customer scrap in the most effective and environmentally responsible manner. The recycling centre is estimated to cost R300 million, which will further advance our manufactured capital. The construction of this plant was within budget and came online in the third quarter of 2015. The facility is now in the process of ramping up to full capacity. 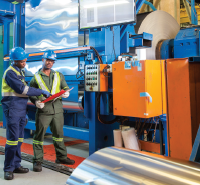 Construction of a new aluminium recycling plant was recently completed at Hulamin’s Camps Drift site in Pietermaritzburg. The R300 million project, that began operating in the third quarter of 2015, has been built to recycle used aluminium beverage cans (UBCs) and other forms of scrap. The new furnace that has been installed at Hulamin’s new Pietermaritzburg recycling plant - a twin chamber Hertwich de-coating and melting furnace - is touted as one of the world’s most energy efficient and environmentally friendly ways to melt scrap. While most other furnaces would simply incinerate the cans, the new Hulamin furnace is able to remelt the thin aluminium, such as the type used in UBCs, while conserving the maximum amount of aluminium from the scrap. 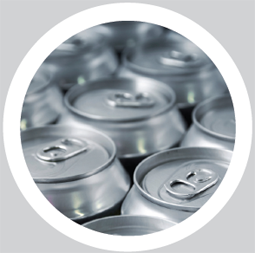 Volatile organic compounds present in coated beverage cans are used as part of the fuel that powers the furnace, with less processed furnace dross to landfill and fewer emissions into the atmosphere too. The plant also incorporates a UBC shredding and cleaning line, and liquid-metal transfer facilities. Using recycled aluminium in place of primary aluminium is a big part of Hulamin’s future plans. Recycling aluminium uses only five percent of the energy needed to produce primary aluminium ore. This new recycling plant will give Hulamin the capacity to process large numbers of all aluminium beverage cans discarded by the country’s consumers into the future and this, combined with aluminium’s high value, low cost of recycling and its ability to be 100% recyclable, means that used aluminium beverage can recycling holds great promise for the company. The strategic assets of Hulamin can be separated into three key areas of which all are important to the overall state-of-the-art facilities that contribute to produce our products. Hulamin has state-of-the-art rolling mills, which roll the slab into coils. The hot mills roll heated slab, substantially reducing it thickness and multiplying its length by up to 24 times. The cold mills further roll the hotrolled coils to achieve the required gauges and properties. The aluminium plate plant is a technologically advanced process that includes heat treatment, sawing, stretching and cut-tolength lines. These items of equipment form part of the finishing processes. These high-tech machines allow for a high-quality product that meets customers’ specific needs. Coils can be coated with paint or lacquer using rollers and then oven-cured. The coil coating process is designed to ensure highly consistent quality. Billet presses push softened metal through dies to create desired profiles, which are then finished by either coating, anodising or fabrication. Hulamin has two extrusion plants, both of which boast these advanced technologies.